In much the same way, The Chiffons were initially discovered and shaped by Brooklyn's Ronald Mack. Judy Craig takes lead vocal, with Barbara Lee, Patricia Bennett, and Sylvia Peterson adding the 'Shooby-doo-wha-wha's'. But it was Mack who wrote He's So Fine, the girls' breakthrough and finest moment. It nudged Ruby & The Romantics' Our Day Will Come off the Billboard #1, to stay there clear through April 1963 (with sometime Drifters' guitarist Butch Mann playing on both chart-toppers!). Mack died of Hodgkin's Disease shortly after the disc was certified gold, so the follow-up - One Fine Day came courtesy of Gerry Goffin and Carole King who originally demo'd the song with Little Eva, but erased her voice and substituted The Chiffons to give the group their second major hit. 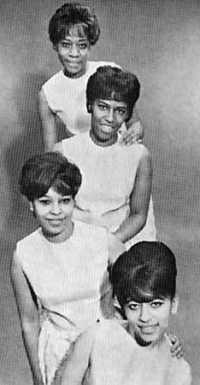 The Tokens, meanwhile, were hanging around as a general all-purpose production and back-up team to manipulate later hits A Love So Fine (#40 in October 1963), I Have A Boyfriend (#36 in January 1964), through to Goffin's Sailor Boy - a near-direct re-write of The Shirelles' Soldier Boy, which failed to chart higher than #81. But by then the girls were playing support to The Rolling Stones' first major US tour. And some minor sweet soul-pop bonbons followed - Out Of This World, and Stop, Look, And Listen, and the mildly psychedelic Nobody Knows What's Going On, until their fortuitous link-up with Doug Morris (later of Lobo fame). He wrote and produced Sweet Talking Guy - which not only returned the girls to the American top 10, but also charted in the UK twice - #31 in 1966, then again as high as #4 in 1972! It's an irresistibly strident record - for sure, with sinuously self-possessed wrap-around harmonies. But deconstruct it further, and things don't look entirely good for Ms Greig's 'self-possessed feminism' thesis. After all, doesn't the success of Sweet Talking Guy re-state, with added emphasis, the suspicion that The Chiffons were entirely dependent on the patronage of others? While, skim beneath the delicious surface, and the songs written for them uniformly present the strictly conventional quest for "that handsome boy over there,/ the one with the wavy hair." After all, Sweet Talking Guy is saying, in effect, he may be a bad go-getter and a mean motor scooter but he's my bad go-getter, so hands off! And their ambition seldom goes beyond this need to become "the envy of all the girls." Even when it's a pursuit both yearningly urgent, and plaintively hopeful - "he's so fine (oh yeah),/ got to be mine (oh yeah),/ sooner or later (oh yeah),/ - I hope it's not later." There are 33 songs generously collected onto Ace's anthology of their Greatest Recordings, with perhaps four such essential purchases, plus a whole bunch of minor knee-tremblers - including their cover of The Angels' My Boyfriend's Back, and a lot of fillers. 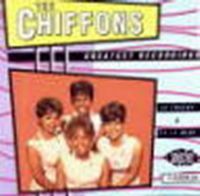 The Chiffons never got around to producing a spin-off star of the calibre of Diana Ross, Martha Reeves, Gladys Knight, or Ronnie Spector to rise above the genre. Judy quit in 1969 - although The Chiffons reformed for a stab at My Sweet Lord in 1976 after they'd won the George Harrison tune-stealing litigation. That's here too. But essentially - despite Charlotte Greig's admirably skilled assertions, The Chiffons remain beautiful adornments. And that's enough. For pure, clear, heart-stopping perfection seldom pours down more exquisitely than it does on their lead-in to He's So Fine... "Doo-lang, doo-lang, doo-lang."